I think we've tried just about every handwriting book out there. Really! I've never loved any of them enough to be sold out, and so I typically buy the newest or the most convenient or whatever. It's handwriting. It's not quantum mechanics. 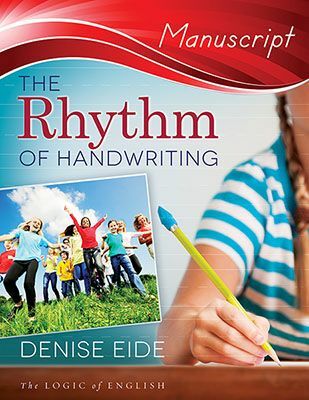 I was unfamiliar with The Logic of English's The Rhythm of Handwriting until it came up as a review opportunity, and since I hadn't purchased Christian's handwriting for first grade yet, I asked to review it. We started with manuscript, and though I know there is great evidence for starting cursive first, I, um, didn't. No real reason other than that every single man in my life, from husband to sons to brothers to friends, writes in manuscript. Every one. And while I will do a unit on cursive so that Christian can read it, I will not die on that most-unimportant (to us) hill. Well. I've got to say, I wasn't really expecting to love a handwriting book, but I do! It's too bad Christian is the next-to-the-last kid here because now I can only use it with one more! First of all, the book is laid out well, and I'm a huge proponent of grab-and-go homeschooling curriculum for the busy mom. In other words, I opened the book, quickly read through the instructions to the teacher (they were simple, to the point, and easy to read), and handed the book to Christian. We sat down together to do the first lesson and I simply had to show him the top line, the midline, and the bottom line. From that first lesson, it was easy to then instruct him in each letter: "Start at the top line. Draw a line straight down to the bottom line. Now pick up your pencil and start at the midline. Draw a little bump down to the bottom line." He got it in no time flat. No handwriting workbooks allow you to just walk away; if you don't supervise the student, they can quickly develop bad habits that lead to funky handwriting. I learned that the hard way. There is plenty of opportunity for practice in The Rhythm of Handwriting. After the initial instruction of how to form a particular letter (done on a large scale, as in the photo above), the student repeats the formation on the following page. I had Christian practice slowly and required him to repeat the letter at least 5 times on each line, depending on his need for practice of that letter. There are review pages as well, so before reaching the end of the book, a student has had ample practice of both lower and uppercase letters. Numbers are covered too, from 0-20 and then 100, 1,000, and 1,000,000. A glossy, card stock foldout posted is included that can be used as a reference guide for a student who might forget how to form their letters. We didn't have a need for it for Christian, but I am hanging on to it for Joe. In terms of ease, straight-forward instruction, and lessons that maybe take 5 minutes for each session, it would be hard to beat The Rhythm of Handwriting. The price is right, too: $15 for the PDF version and $18 for the printed softcover book. The Rhythm of Handwriting is a winner!